10 Simple Chia Recipes by Marion Gray who has been using and helping customers with chia seeds for 7 years and Chia Seed. * Chia, Quinoa, Raspberry, Cashew Porridge * Spicy Chia Corn Grits * Chia Tomato Soup with Veggies * Chia Mashed Potatoes * Remi Honey Dew Chia Tea Smoothie * Quinoa, Raspberry, Cashew Porridge * Chia Orange Dream Shake * Chia Peanut Butter Chocolate Chip Pudding * Chia Banana Ice Cream Acai Bar Sundae * Traditional Chia Cake w Chai * Chia Coconut Date Cookies............................................................................................................................................................................................... Chia Seeds: A simple guide to a Healthy Lifestyle Chia Seeds: An Interview with Researcher William Anderson covers a wide range of territory with a simple format. What is Chia? What health benefits does Chia offer? The book clearly explains the features and benefits of Chia seeds such as lowering cholesterol, controlling blood sugar levels, weight loss and a description of its incredible nutrition profile. 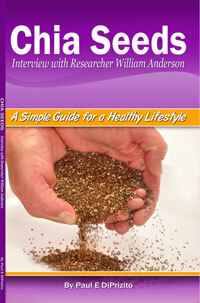 Chia seeds are also high in vitamins, minerals, and omega 3 fatty acids for a healthy heart. Complimented with 10 simple recipes, all this and more through a simple 20 question interview with Chia expert William Anderson." Hello. 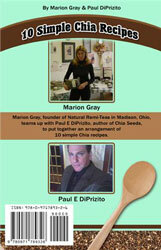 My name is Marion Gray and I am from Madison, Ohio. Everyone always asks me why I started the store, where did you learn, and how did you learn all that you know. I am not a doctor and I have had no special medical training. I have never claimed to have any. Before learning about my thyroid condition, I would have never thought of running my own store. I have an under active thyroid, a gastric ulcer, acute gastritis, gerd, and irritable bowel syndrome. I have fought with these ailments for over 17 years. I want more people to experience the healthy benefits of chia seeds and with this book, people can more easily see how to implement them in their diets for themselves and others.